MONTREAL — The thorny issue of immigration sparked the most animated exchanges during the Quebec leaders' debate Thursday, with the front-runner in the polls having to defend his position to expel immigrants who fail a French test after three years in the province. 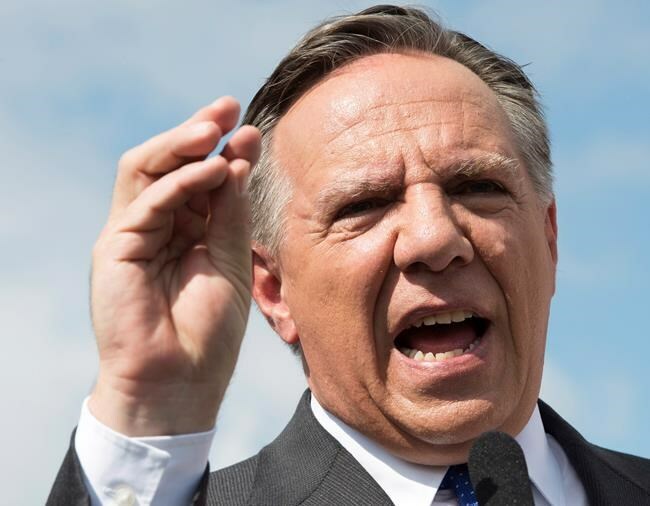 Coalition Avenir Quebec Leader Francois Legault was hit from all sides for his controversial position, which he says is necessary to preserve Quebec's language and identity from waves of non-French-speaking immigrants. Legault dismissed suggestions his policy would affect many people. "Why should someone fail a French test if they can take French classes for free?" he said, referring to the province's subsidized language classes for newcomers. While earlier segments in the debate saw Philippe Couillard have to defend his government's cuts to education and health care, the Liberal leader went on the attack on the politically charged immigration issue. Couillard told Legault his "expulsion test" is making newcomers to the province "afraid of you." "You scare people, Mr. Legault," the premier said. "You scare them. These families, these men, these women, these children who listen to you, you scare them." Legault's response was blunt: "Quebecers are tired of you giving them lessons." Parti Quebecois Leader Jean-Francois Lisee then had his turn to attack Legault on his position, accusing the Coalition leader of wanting to create thousands of "paperless" people threatened with expulsion from the province. "We're not talking about expelling citizens," Legault said. "We're talking about expelling people who aren't citizens yet." Couillard said he would maintain annual immigration levels at about 50,000 people, saying Quebec needs workers due to labour shortages across the province. Legault wants to reduce immigration to the province by 20 per cent year, or by roughly 10,000 people, in order to better integrate them and to ensure there are enough services to help them learn to speak French. While Lisee says "experts" should recommend how many immigrants can be properly integrated into Quebec society every year, he has said 50,000 is too high. Manon Masse, one of Quebec solidaire's two co-spokespeople (the fourth-placed party in the legislature does not have leaders), said the current immigration levels are appropriate — but that the province needs more visible minorities in the public service. "Integration starts with jobs," she said. "The issue of immigration is not about a number. We have a great country here, with great resources. We need to integrate immigrants better." Earlier in the debate, Couillard was clearly the main target of the other three on stage, as he defended his government's cuts in the first years of the Liberal mandate in the Health and Education departments. Couillard said the cuts led to several balanced budgets and surpluses that have allowed Quebec to responsibly invest in services and pay down debt. Legault said he'll "never forgive" Couillard for reducing services to special-need kids, while Lisee insisted the Liberal cuts caused "human misery." Despite the recent reinvestment in the health network, the Liberals' budgetary compressions between 2014 and 2016 led to cuts totalling almost $1 billion, according to IRIS, a left-leaning research institute. The same institute said the Couillard government's so-called austerity initiatives resulted in cuts to school budgets totalling roughly $675 million — $337 million in the elementary and high school system alone. However, the lean years allowed Quebec to post consecutive balanced budgets, increase its credit rating and pay down debt, which has decreased for three years in a row. As of March 2018, the province's gross debt stood at $204.5 billion, representing 49.6 per cent of GDP, down from the peak of 54.3 per cent in 2014-15. Couillard's opponents also reminded him of how nurses and orderlies are overworked and burned out, how elderly patients in long-term care facilities don't get enough baths and how medical specialists are overpaid, leaving less money for patient services. The Liberal leader, who is seeking another term as premier in the Oct. 1 vote, said "there has been more money than ever for home care" since his government's election in 2014, and he promised to hire more nurses and orderlies to give better services for patients. Lisee came out strong against Couillard, calling his record on health "shameful." "You are right to be frightened because what we have seen over the last four years is simply shameful," Lisee told the first citizen to ask a question in the debate after she said she was scared of ending up in one of the long-term care centres. Legault also hit Couillard hard on the topic. "Our elderly have the right to be treated with more dignity, so we need more staff in these long-term care facilities and to have them renovated," he said. Couillard countered by reminding the leaders that "everyone has compassion around here." He said he had no choice but to make budget compressions because the previous PQ government left a multibillion-dollar deficit his government had to attack. Masse, meanwhile, said her party is the only one "with the courage" to collect more money to pay for services. Quebec solidaire is promising to find $13 billion more a year for the state, mostly from wealthier Quebecers and large companies. There will be two other televised debates — one in English next Monday and another in French on Sept. 20.